A series of events this spring has turned the annual breakup of the Kuskokwim river into a real life drama illustrating the awesome power Mother Nature can unleash under the right circumstances. The ice stayed in longer then typical and a spell of some warm weather coupled with some substantial precipitation in the watershed area caused some significant ice jamming issues. The drama started to unfold Sunday May 12th in McGrath which is the first substantial town on the river and the point in which the iditarod dog race traverses the river each year. As the ice went out there, an ice jam formed just east of town. As that ice jam released, jammed up and released again, the ice and water released had a ripple effect down stream where some parts of the river had gone out and other parts hadn't. Flooding began in McGrath once the ice jam let loose. The ice chunks cut loose from the recurrent McGrath jams then jammed up at "The Elbow" just past Sleetmute, which is 86 miles upstream from Crow Village. The ice jam broke at Sleetmute Sunday night and the on-rush of water/ice from that event flooded Red Devil just downstream. 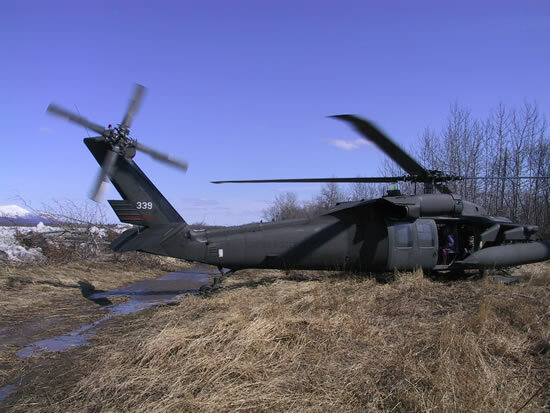 The town of Red Devil had to be evacuated by helicopter and villages downstream were put on alert. The ice went out in Aniak Sunday night at about 7:30 pm, but then it jammed up at 2am (Monday) just above Crow Village bluff. Crow Village remained high and dry with the ice jam upstream protecting it. A warning was issued for a river swell of 4-6' of water to arrive Monday afternoon in Aniak. Before the swell arrived, river level was 4' from the top of the dike. The town of Aniak has begun flooding though. Helicopters evacuated people from the other side of Aniak slough (including David's mom). The whole basement of Aniak lodge was flooded. There was 2-3' of water running on the street in front of the lodge. The AC store lost a bunch of their lumber that floated away. Lisa and David's snowmachines are stacked on top of crates on top of barrels and they moved quickly to protect the 4 wheeler as well according to our correspondent in the field. The ice jam just east of Crow Village partially broke 4 pm Monday, and the ice ran for less then an hour and started jamming again. Water levels rose to near the top of the Dike while the ice was running, and began flowing over the Dike in 4 locations once the ice jammed up again. By 6pm the "swell" hit Aniak and things worsened. 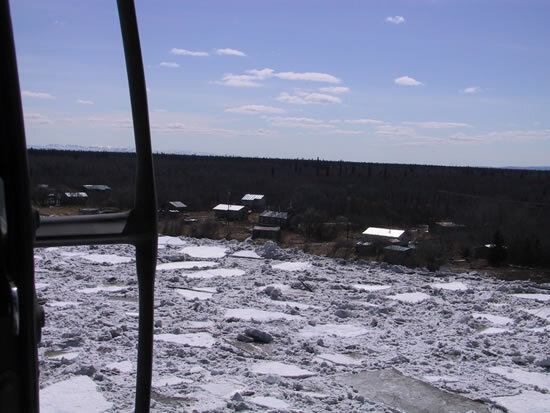 Several areas of Aniak are flooded and that is expected to continue while the ice jam holds. By Tuesday morning water had flowed over the dike in 14 places, but the water had receded several feet. Everyone in Aniak were safe from that first swell, but water and ice are being held precariously by the slightly damaged dike. Another ice jam that had been holding at The Elbow broke on Tuesday and was observed passing the Village of Red Devil at 4 PM Tuesday. Water levels rose about 4 feet as this ice ran past the Village. This ice and water arrived at the upstream end of the jam at Aniak late Tuesday night. Officials began considering evacuating the entire town to either Bethel or Anchorage. Arial surveillance of Crow Village confirmed it was still well above the water level. Wednesday morning at 10 am, the water had risen back to it's high mark from the previous day. Water began flowing over the dike in a few spots, but for the most part it was holding good. Officials continued to closely monitor the situation in case they decided they would initiate an evacuation. The "Crow" was readied for evacuation if required. The plan for that evacuation was to navigate from Aniak lodge to the airport using the Crow via shortest route using bolt cutters to negotiate the fence on that route. Aniak shut down electrical power shortly thereafter as a safety measure. 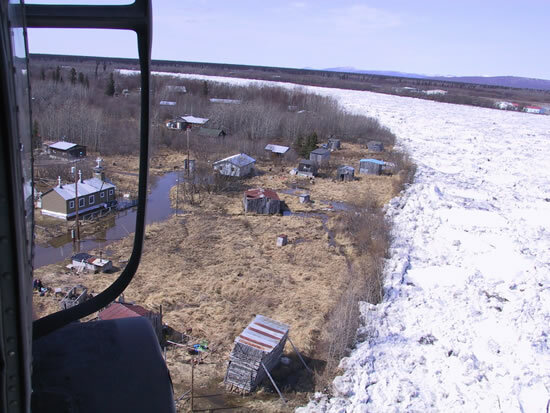 As of noon Wednesday, the ice jam was still in place 2 miles downstream from Aniak was continuing to cause flooding in town. The runway was still partially flooded along with some roads. More ice and higher water entered the area from a jam that was released Tuesday in McGrath. Significant flooding remained a possibility. The flood warning was extended until 4pm Thursday. The news desk received another update from chief correspondent Storm Phillips at 3pm Wednesday. Agent Storm is a veteran with over 4 years of involvement in Crow Village news events. The portion of the ice jam extending downstream from the mouth of the Aniak Slough broke free, opening a partial drainage for the water backed up in front of Aniak through The Slough. 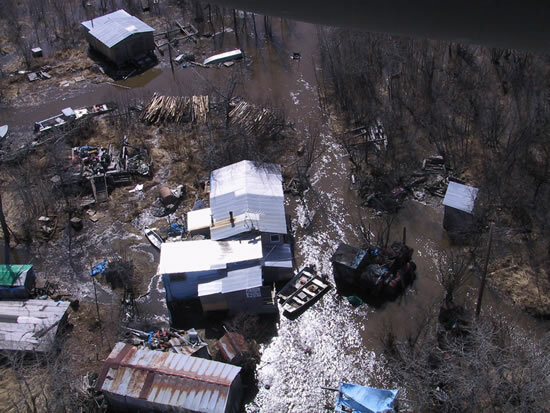 Power has been restored in Aniak once again, and the water is starting to retreat. Water was still present in the Aniak Lodge however. By 5pm the water level had fallen a by a foot and a half and ice flows from upstream were now passing through the Slough. An update from the Crow Village mayor on Thursday morning indicated that conditions in Aniak had improved substantially. The ice jam had begun moving out and water had receeded considerably. 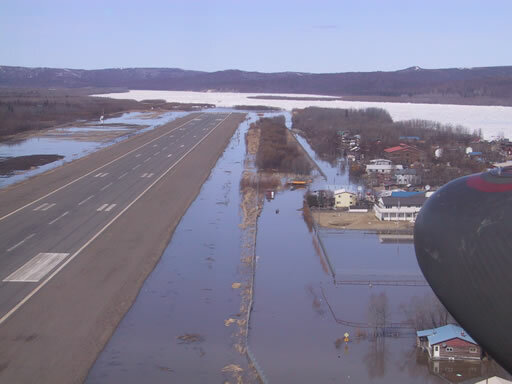 There was no water in the Aniak Lodge and the airport runway was now completely above water. Water level was halfway down the dike and the cleanup has begun. Preliminary damage assessments indicated a few roads had partially washed out, and the Dike sustained some damage in a few spots. Woody Wooderson's house on the other side sustained substantial damage from ice. Amazingly, by Thursday, our journalistic colleagues at Anchorage Daily News had picked up on the story. You can click on this link to read that. Feel free to compare the accuracy and completness of their description with what you find here and bear in mind that update is coming from an agency who recently raised their subscription rates by 30%. Of course Crow Village Has It still has no subscription rate, but you get no service guarentee either! By Friday morning, the ice jam had cleared and all flood warnings had been suspended. Preparations are once again in full swing for the event everybody is talking about - the Crow Village 2002 Deck Party. An unconfirmed source has indicated the Crow Village Apparrel Committee may have a special surpise in store for those attending that event.